I had so much fun for 3 months cooking up a storm of Plant Based food for 28 hungry workers for 3 months with my lovely friend @whengingermetgarlic. We were in the forests of Northern California with fresh beautiful, organic ingredients and a pantry full of spices, sauces and coconuts. Sam, the owner of @whengingermetgarlic had spent a while living in Sri Lanka and learning their cooking techniques and I was so excited to steal some of that knowledge. I have been cooking Dhal for years and sort of always did it the same way, but with these amazing additions it really makes the dish special. It is a perfect dish to make when you need to feed a lot of people, but also great when you are just home and feel like some healthy comfort food. 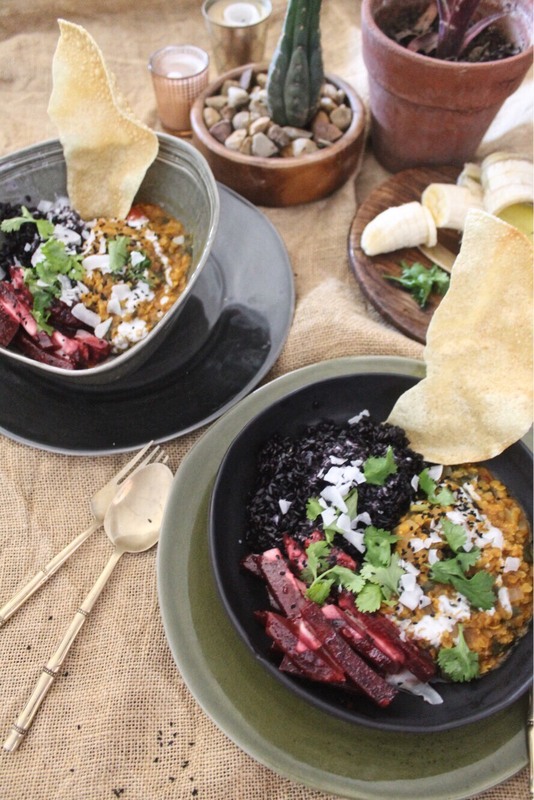 So for lunch today while we were busy planning our future I cooked up some Dhal and beetroot and here's how it went. In a large pot put a tablespoon of coconut oil ( or any oil you have) and put on to slowly cook the onions, garlic and ginger. When the onions are transparent add in all the spices for and fry for a bit, stirring as you go to make sure the spices don't burn. They will stick a little don't worry they will come off with the liquid. Add in the lentils and tomato and cover with water until the water covers over a cm above the lentils. Let this cook on slow while you make your rice, you can use any rice. I like black, red or wild rice as it has a lot more nutrition in it that white rice and to me tastes amazing. Put another pan on the stove with coconut oil and the garlic and ginger for the beetroot in, let that slowly simmer while you prep the beetroot. Add your beetroot into the pan and let it fry with the spice until it starts to stick, then add about 100 mls of water just to make sure they are boiling. Check on the dhal and add more water. The dhal is supposed to be like a thick soup consistency, but of course you can make it as you like it. I always taste as I go and add spices and salt where needed. Also add in the fresh coriander and keep a little for serving. I have also added in spinach r kale at this point to get in my iron and calcium. Check the beetroot is cooked, you want it soft but with a little cruch to it. Once it is like that add the coconut milk and let it cook into a beautiful creamy pink sauce. Once everything has cooked, it should take about 45 minutes for it all to cook. You can serve it up. What I love about indian food is all the add ons, so go wild. I love adding banana, ground coconut and poppadoms.